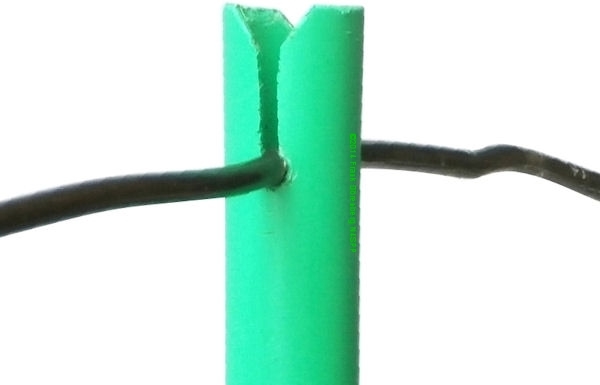 The two halves of the folded dipole can be thought of as two transmission line stubs that are shorted at the end. The inductance of these stubs can compensates the capacitive reactance of a shortened dipole. However, as the folded dipole is relatively small (< 0.75λ) to the wavelength, it is not a true travelling-wave antenna like a Rhombic or Beverage. The feedpoint impedance at resonance of a half-wave folded dipole is four times that of a regular half-wave dipole. I.e., ≈ 4 x 72 = 288 Ω (in free-space), practically ≈ 240 -280 Ω. 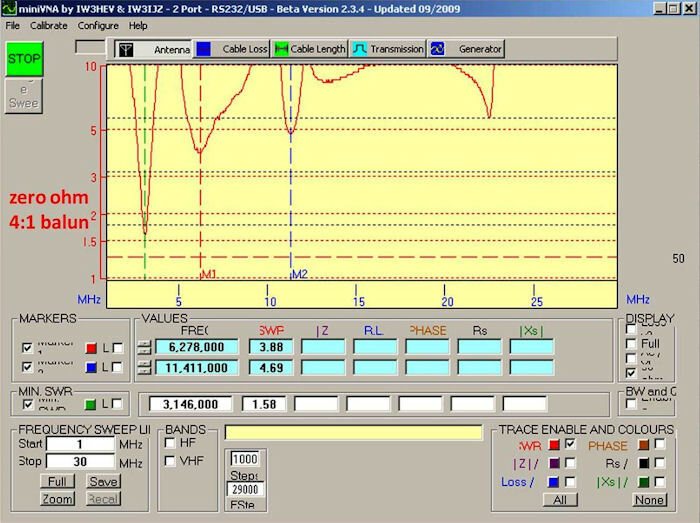 This is close to the characteristic impedance of 300 Ω twin-lead cable. A 4:1 balun transformer at the feedpoint can provide reasonable matching to a 50 or 70 Ω coax. See ref. 7 for an on-line calculator. Folded dipoles do have a slightly larger bandwidth then the equivalent un-folded dipole. Ref. 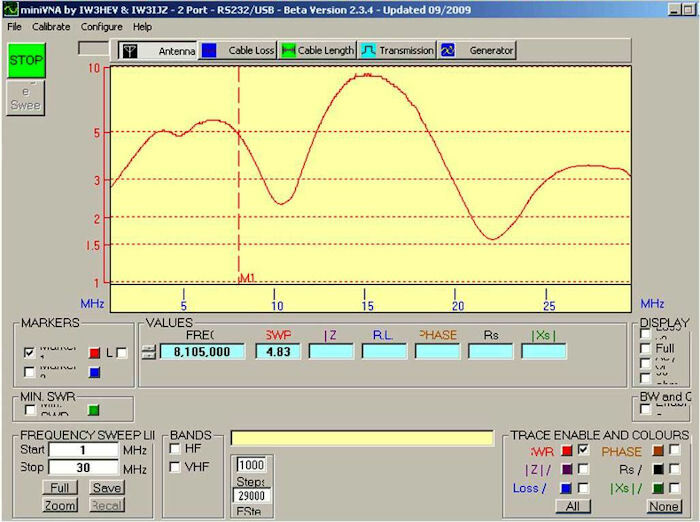 1-6.
the dipole ends left open, and a 300 or 450 Ω twin-lead or a 600 Ω ladder line to a symmetrical Antenna Tuning Unit. 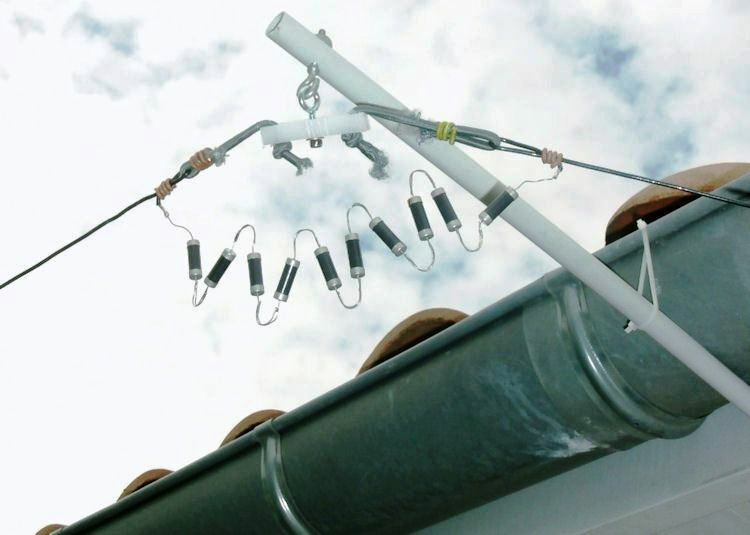 the dipole ends bridged with a terminating resistor, and a 300 or 450 Ω twin-lead or a 600 Ω ladder line to a symmetrical Antenna Tuning Unit. the dipole ends bridged with a terminating resistor, a 9:1 current balun (or 12:1 for a 1000 Ω terminating resistor) at the feed point, and 50 Ω coax to the transceiver. TFDs have a terminating resistor across the ends of the folded dipole legs. It helps make the antenna appear to be broadband, by masking large impedance variations. As the terminating resistance is transformed to the feedpoint impedance, its value (combined with the span & spacing of the dipole and the wire diameter) is quite important. The resistor has to be inductance-free. At the very low end of the operating frequency range, it will have to be able to dissipate as much as 90% of the transmitter output power - more than the 50% of a terminated Rhombic or Beverage. 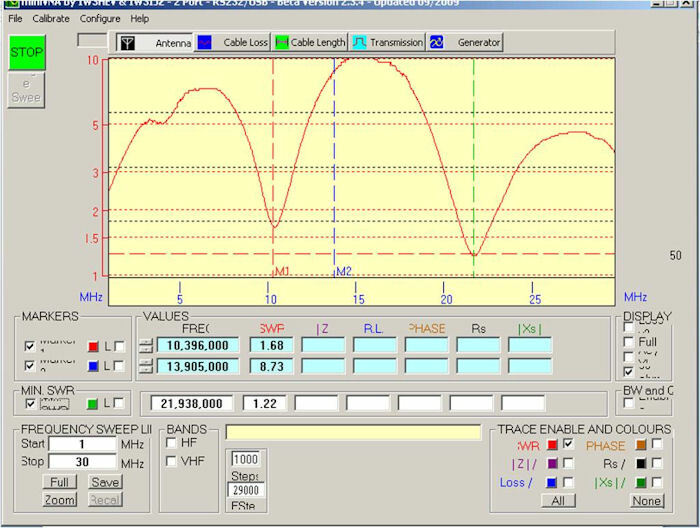 The recommended resistor value appears to be 1.1 times the characteristic impedance of the feedline, multiplied by the transformation ratio of the balun (if installed). Example: for 50 Ω coax and a 9:1 balun we obtain a resistance value of 495 Ω. 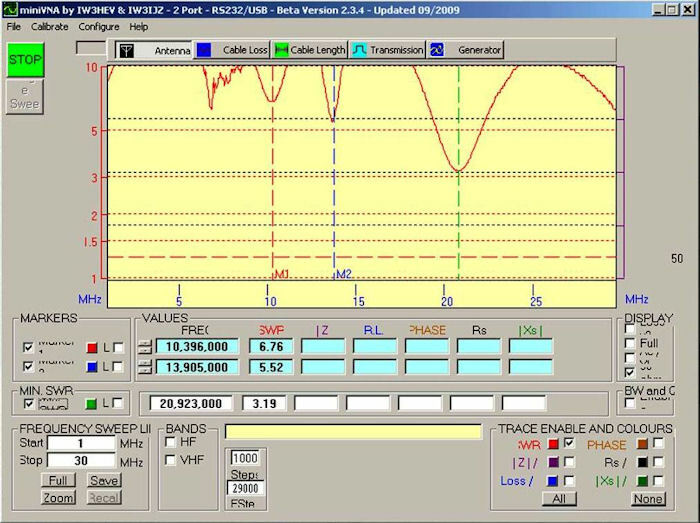 Note that it is not easy to make a 9:1 balun with a flat transformation ratio over multiple bands, and balun losses increase on frequencies for which the antenna is shorter than 0.25λ. Installation is typically oriented horizontally ("flat top") or "tilted" (up to 30 deg). Have not seen such HF antennas installed vertically. Another option is an Inverted-V configuration (spacers horizontally). constant sensitivity over the entire frequency range without an antenna tuner - antenna "sensitivity"??? height is not a prerequisite (10 ft minimum) - since it is not used as a resonant antenna, coupling to nearby objects is indeed reduced. As always, the Universal Law of Conservation of Misery applies: you don't get something for nothing! 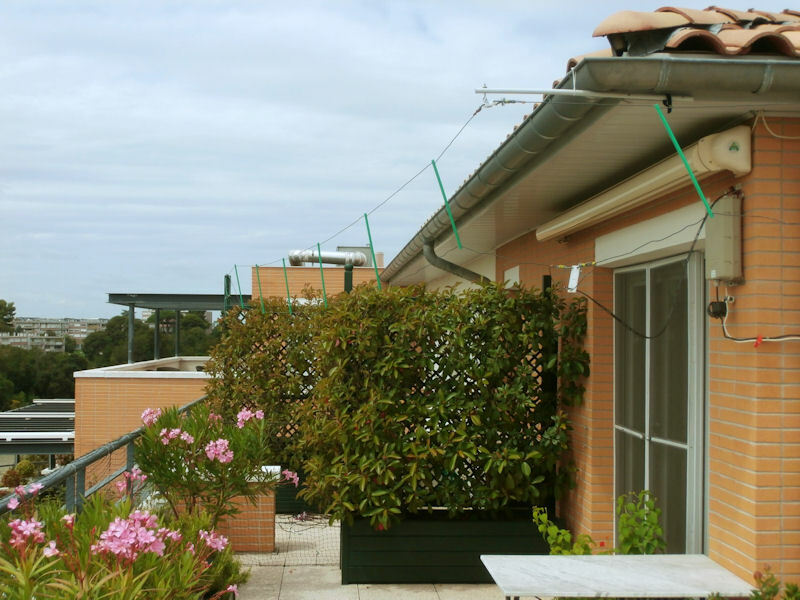 These antennas are convenient as they can indeed be made broadband - but at the cost of performance... I really do not see much advantage, if any, over a standard ("unfolded") dipole with the same span, and fed via twin-lead or ladder line and an (automatic) ATU. But, in all fairness, antenna tuners are often an overlooked source of sometimes significant losses. This type of antennas is commercially available from a number of sources (ref. 9). 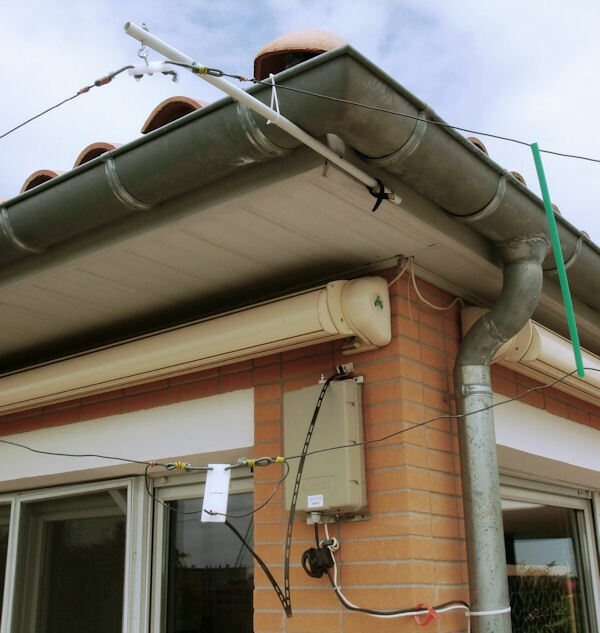 For experimental and "household" use, such antennas can be made for a fraction of their prices. Which is what I did. 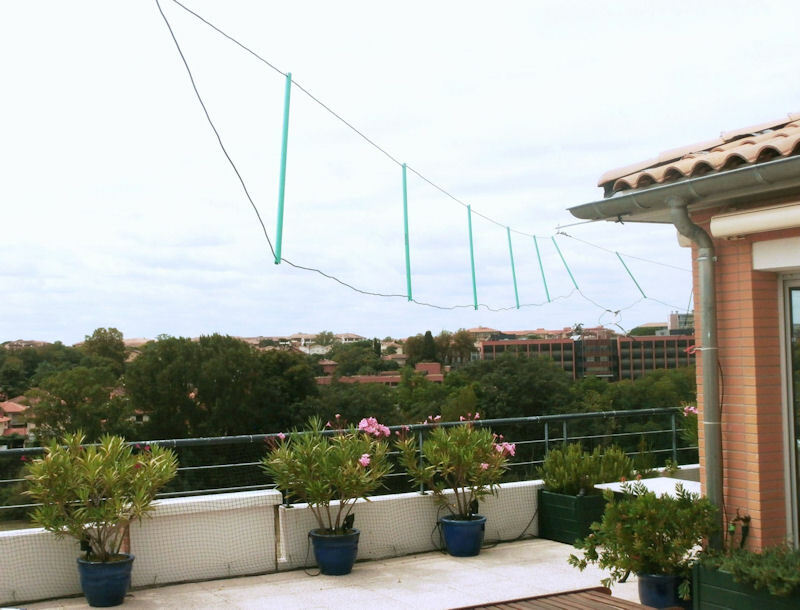 My reason for doing some experiments with folded dipoles, is that I had a dipole laying around that is too long (2x13.4 m = 2x44 ft) for my terrace. So why not fold it and see what happens? Note: I have not completed all necessary experiments and measurements yet. One of these days I may dig up the antenna from my "antenna cemetery" and finish it, for a final verdict. Detailed modeling of (T)FDs is quite complex and probably more dependent on the design parameters (span, wire spacing, wire diameter,…) than is generally realized. As Terminated Folded Dipoles are typically smaller than 1 wavelength, they are not true travelling wave antennas like terminated antennas such as the Rhombic and Beverage (though they may have some similar characteristics). For the lowest operating frequencies, the TFD does not appear to have the 50% loss of the Rhombic & Beverage, but even closer to 90% (ref. 10). That said, for the (described) experiments that I did do, I did not notice a particularly low background noise level, possibly because it is always high below 7 MHz at my QTH. Also, at my QTH, I am basically condemned to verticals, as I cannot (fully) install dipoles etc higher than about 2-3 m (6-10 ft) . So they are all deaf, or only usable for NVIS / local QSOs, which does not interest me. In 2001, Ulf (DL3KS) characterized his TFD with a very large number of current and power measurements, see the curves in the figure below. 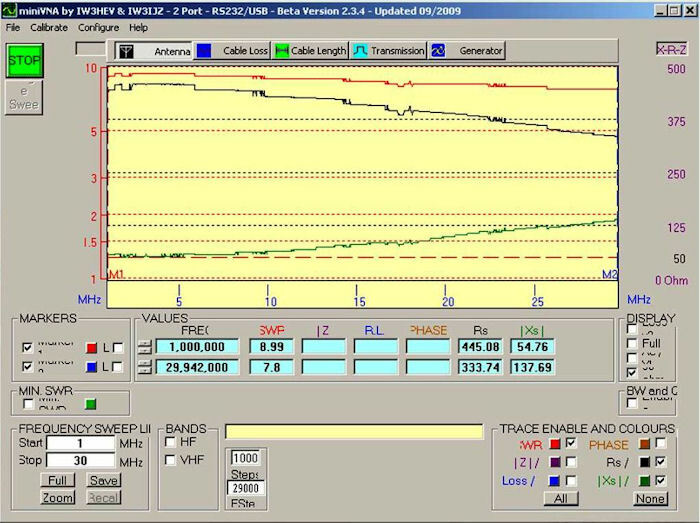 His T2FD had a span of 55 m (180 ft), wire spacing of 1.5 m (5 ft) at the tips and 75 cm (2.5 ft) at the center, and installation height (bottom wire) of at 5.5-12m (18-39 ft), a termination resistor of 400 Ω, a 9:1 balun, and 7m (23 ft) of RG213 coax. The total loss curve is not at all flat, unlike maybe the SWR curve. We all know how to make a simple wire dipole, so I am not going to describe that. As stated above, I used a 2x13.4 m (2x 44 ft) dipole that I had laying around. It is made of AWG #14 (1.6 mm Ø) multi-strand THNN insulated wire form the Do It Yourself store. Basically the only other items needed are spreaders/spacers, a second center-insulator, and an (optional) impedance transformer. For the "terminated" folded dipole, we need a non-inductive terminating resistor. More on that later. I got two 2.5 m (8 ft) standard length sections of very light-weight PVC tubing: 12 mm (12") outer diameter , 0.8 mm wall thickness. I cut each of them up into 6 sections of 41 cm (16"). I drilled a small hole through the tip of each spacer (making sure that they are aligned!. The holes have a diameter that is slightly smaller than the thickness of the wire. This makes a nice tight fit when the wire is clipped to the tip of the spreader. Then I cut a slit from the tip of each spacer to each hole. The cut has to be narrower than the diameter of the holes, so a thin-kerf saw blade is needed. The antenna generally has a high impedance (several thousand ohm) on most bands. So an impedance transformation ratio of about 1:50 to 1:60 is needed to get down to 50 Ω. I.e., a turns ratio of about 1:7 to 1:8. The ratio that you actually need, depends on the antenna's wire diameter vs. its length, installation height, and the local environment. 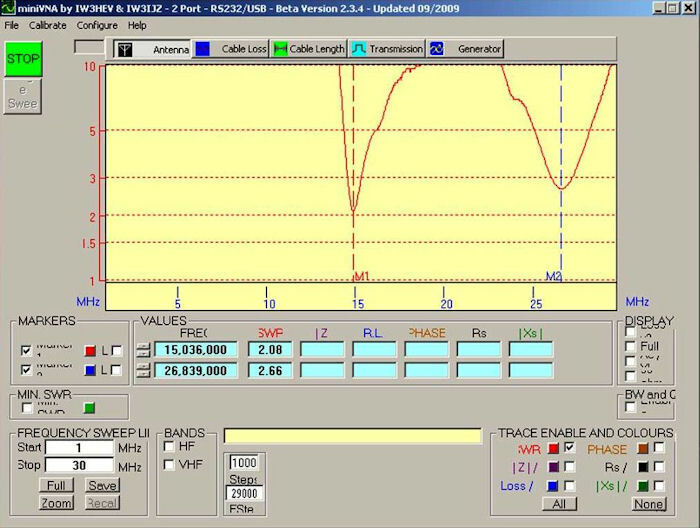 Once my folded dipole was suspended on my terrace, I hooked up my miniVNA antenna analyzer. First antenna configuration: un-terminated folded dipole. I didn't feel like building a 9:1 balun for this experiment, so I dusted off my 4:1 balun, and installed it at the feedpoint of the antenna. The SWR plot now shows five SWR dips in the 1-30 MHz range, none in an amateur radio band. Of course, without the dummy-load terminating resistor, SWR is definitely nowhere near flat. Next, I simply interconnected (shorted) the ends of the dipole wires. The folded dipole is now a closed rectangular loop. Obviously, the resistors are not perfectly "non-inductive". 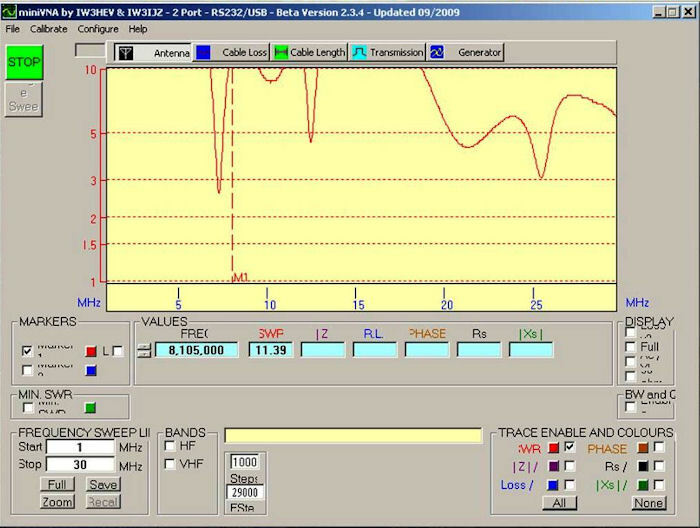 The plot below shows that the resistance value Rs varies little on HF, but closer 30 MHz, the inductive reactance begins to become noticeable (green line). Ref. 9: TFD antennas are commercially available from a number of sources such as the following (list prices for the USA are from 2014). Note: I am in no way affiliated with any of these manufacturers, I do not endorse any of their products, I do not support their claims regarding the performance of their products! Ref. 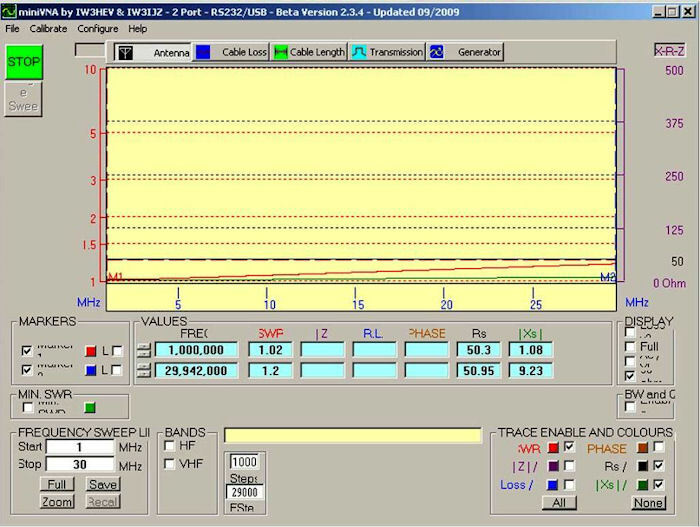 9E: BuxComm (models 180T2FD, 1606T2FD): $250 - $280; "when transmitting: SWR 1.2-1.5 or 1.1-2.5 from 3.5-30 MHz"
Ref. 9F: Barker & Williamson (models BWD-90), now only "military" version (stainless steel wire models BWDS-20N - BWDS-180N): $825 - $1420. Note: they are advertised for NVIS operation, i.e., not for DX! Ref. 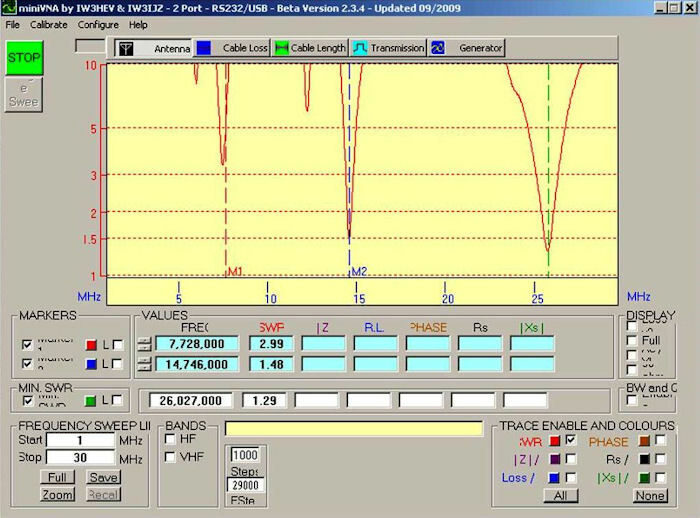 10: "A Close Look at the Terminated Folded Dipole Antenna", Joel Hallas (W1ZR), in "QST", September 2010, pp. 51-52 See note at bottom of page. Ref. 11: "Wirkungsgradmessung an einer T2FD Antenne" [in German; performance measurement of a T2TD antenna], Ulf Schneider (Dl3KS), in "Funkamateur", Nr.1, 2001, pp. 100-101 See note at bottom of page. Note: due to copyright reasons, this file is in a password-protected directory. Contact me if you need access for research or personal study purposes.